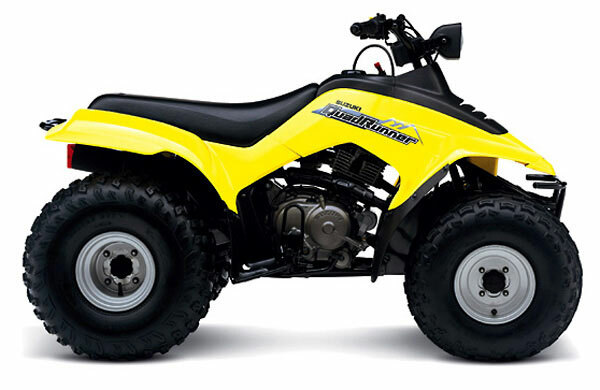 Reliable 4-stroke design accommodates a wide range of adult riders. Compact single cylinder, four-stroke engine for strong performance. 5-speed transmission with automatic clutch that helps to provide smooth acceleration and transmission shifting. The transmission also features a convenient reverse gear. Water resistant, snorkel-type air intake system. Two-stage choke for easy starting in cold weather. U.S. Forest Service approved spark arrester. Single A-arm, oil-damped front suspension and single shock rear suspension with adjustable spring preload. Dual mechanical drum front brakes and enclosed mechanical drum rear brake. Enclosed O-ring sealed drive chain. Keyed ignition switch for added security. Convenient reverse gear indicator light and neutral indicator light. 8.5 liter (2.24 gallon) fuel tank with fuel petcock and reserve position. Large 45-watt headlight with high and low beam.